Let Kenny's Tile show you why we are the preferred home remodeling company in Prairie Village. We have been offering residents of Prairie Village, and the surrounding area, fine-quality tile and floor coverings since 1954. Our showroom has several design ideas for you to pick up inspiration along with your floor coverings for any Prairie home remodeling project. 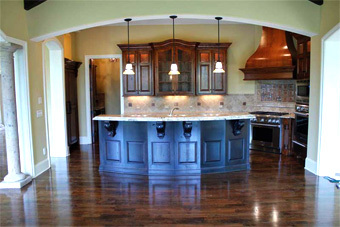 Among the floor covering products we offer for our Prairie Village customers are stone, hardwood floors, carpet. Stone has a luxurious look, and a timeless elegance that goes well with a variety of decor themes. Its durability is an added bonus. Hardwood floors are traditional, and ideal for homes with design styles that pair well with the natural look of hardwood flooring. Carpeting provides a soft cushion under the feet. Sinking bare feet into a plush carpet after a long day at work is one of life's little pleasures. Other products you can see at our showroom for installation in Prairie Village homes are staircases, countertops, and bathtubs. Even professionals will acknowledge that staircases should be built by a professional builder. The precise measurements and cuts required, in addition to the added difficulty of building something over 10-feet-high, makes job too much for a do-it-yourselfer. Let us at Kenny's Tile take care of your stairs. Replacing the old countertops in your kitchen or bathroom is a perfect way to revive the look of the room, and a new bathtub can make the bathroom a more inviting place to bathe. The hardwood floors in the homes of Praire Village start to show their wear and tear over the years. Eventually the time comes where it's time to refinish the hardwood floors. A refinished floor restores the beauty and depth of the wood flooring and really helps to freshen up the inside of the home. Our hardwood floor refinishing crew uses a dustless refinishing system that helps reduce the mess in a refinishing project. Our team can also help you choose the right stain and finish for your hardwood floors that helps to accentuate your design style. There are many stains available in the market today, and we have many styles available in our showroom. The whole sanding and staining process is easy and goes smoothly with the Kenny's hardwood flooring team. Here at Kenny's Tile, we want to be your floor covering and remodeling specialist. To see the many options in our inventory, please visit our showroom just minutes from the Prairie Village area. We would love to help you find the best products for your home. Visit our showroom and learn just how easy it is to design that new bathroom, kitchen or stairwell for your next home remodeling project. For every home in Prairie Village, the perfect carpeting style or hardwood flooring can be found with a single visit to Kenny's Tile.